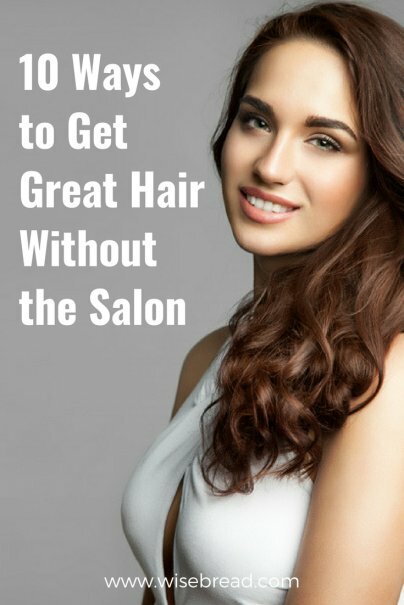 If you want to look your best without having to spend a fortune at the salon, there are several simple things you can do to improve the condition and appearance of your hair from home. Here are some of the best tips out there. Most hairstylists recommend that their clients wash their hair between one to three times per week, depending on hair type and condition. For instance, if you have thick hair, you may be able to get by just washing your hair once per week. On the other hand, if you have fine hair, you may need to wash every other day. The less you wash, the better your hair will look and feel. The natural oils of your scalp are good for your hair and washing them away every day won't do you any good. Dry shampoo can keep your hair looking and feeling clean on the days when you don't wash it, while allowing the natural oils from your scalp to moisturize and nourish your hair. You can also experiment with up-dos on days when your hair looks like it needs a wash. Using hot tools on your hair, such as a blow dryer, curling iron, or hair straightener, can cause a lot of damage. Whenever possible, skip the hot tools and let your hair air dry or commit to an up-do for the day. You should make efforts to be gentle with your hair. Go easy when brushing it, styling it, washing it, and don't attempt to pull tangles out. Treat your hair gently, especially if it is in a growing stage, and you will notice a difference in the length, fullness, and condition of your hair. If your hair tangles easily, you may want to invest in a detangling comb and detangling spray to help. Giving your scalp a good massage every so often can also help initiate hair growth. Cotton pillowcases remove moisture from the hair and can cause your hair to tangle and pull in the night. On the other hand, satin pillowcases won't pull your hair when you sleep, which can result in less hair loss, breakage, and damage. Silk or satin pillowcases feel great to sleep on, are easier on the skin, and can help improve your hair over time. They can even help preserve your style from the night before. Water and nutrients are the keys to great hair. Make sure you are drinking enough water, eating a healthy diet rich in vitamins, and taking a multivitamin every day. You may also want to add supplements like fish oil, biotin, zinc, vitamins A, C, and E, or a hair growth product for men or one specifically designed for women. It's also important to get a moderate amount of exercise every day, which can help improve your overall health and lifestyle, which results in better hair. Whether you want to create a DIY hair mask using ingredients in your kitchen or you would rather just slather quality oil through your hair, you can achieve big results by just taking advantage of hair treatments at home. Using argan oil, olive oil, or coconut oil as a hair mask or leave-in treatment can improve your hair's shine, health, and overall condition. It also means you can skip the costly deep conditioning treatments at the salon. Things like the sun and chlorine are very damaging to hair. Whenever possible, try to protect your hair from the sun, by doing things like finding hair products with sunscreen in them or wearing a hat. If you will be swimming, consider applying argan oil to your hair first, which can help protect your hair from damage and the green appearance of chlorine. Dyeing your hair at the salon every six weeks can cost around $100 each time, while your first DIY hair coloring job will cost around $25. Once you have completed the first $25 dye job, every treatment thereafter will be more affordable because you already have most of the tools you need. Dyeing your hair at home can achieve similar results to those you can get at the salon, at a much lower price point. Some at-home dyes can actually improve the condition of your hair after you use them, so there's no reason to visit the salon as often, especially just for root touch-ups. However, if you're not comfortable dyeing your hair or you're not sure which products you'll need to achieve the results you're looking for, then don't attempt it. A bad dye job can take even more money and time to correct, and will end up just damaging your hair in the end. Certain products can completely change the way your hair looks and feels. They can help fight dryness, frizz, dullness, split ends, and any other issues you may be facing with your hair. However, it can take some time to find the right products for your hair, which can also mean an investment of time and money. You may want to consider subscribing to a beauty subscription box (such as Birchbox, Ipsy, or Glossybox). Your subscription will include several products designed for your hair in one affordable box every month, which can help save you money and allow you to try several products at once to see what's right for you. When it is time to visit the salon, inquire about whether they offer loyalty rewards or referral programs so you can get more out of your investment. Make sure to also take advantage of your stylist's knowledge. Ask what you can do to improve your hair, how you can extend the time between visits, and what types of products are right for your hair. They can also give you styling tips and advice on how to make your morning routine even shorter, so make sure to take advantage of every second in the chair. Do you have any other tips on how to improve your hair without having to make an extra trip to the salon? Please share your thoughts in the comments! Read the ingredients on the box dyes, metallic salts, peroxide, ammonia, PPD, etc. They are not only destroying your hair, but those toxic chemicals are absorbed through your skin. The MSDS for PPD recommends avoiding contact with the skin. How close can I get the color to my roots without taking my scalp? I have used henna to color my hair and the results are fantastic. It can be a little messy, so prepare accordingly. It helps to have an extra set of hands to help. My guy who trims my hair has also become my colorist and he applies the henna and ensures I have good coverage. It leaves my hair soft, shiny and covers my gray quite well. About $15 per application, so it is affordable.